Special software used to circumvent the government filters could still be downloaded easily. And on Monday, as on other days, there were calls for protests online and on foreign-based Persian-language satellite channels. The blockage of the internet applications was lifted today. The original protests over economic issues seem to have died down after President Rouhani confirmed the right to protest, conceded economic problems and promised to take them on. Indeed there are only few new videos of genuine protest marches but an avalanche of videos of rioting, arson and tussling with police forces. The size of the protests are in a few hundred people or less. Counter demonstrations, expressing loyalty for the republic (not noted in "western" media), are bigger in size than the anti-government protests. Since December 28 protests and riots have occurred in a total of 66 cities by now, but only about 30 have been taking place each night. This might point to some planning behind the events. A daily switching of venues might be intended to prevent police preparations. The groups of rioters are between 30 and 80 people in size with a some bystanders milling around. They seem to follow a flash mob strategy appearing here and there and to vanish again when police appears in force. In some cities rioters attacked police stations, military posts and were even stealing firetrucks. Some of the rioters are evidently trying to get their hands on weapons. Altogether only a few thousand people, overwhelmingly male youth, seem to be involved. Thousands protest in Israel each week against the corruption of Prime Minister Netanyahoo. On New-Years-Eve more than 1,000 cars in France were set alight by arsonists. None of this is front page news but a few dozen riots in Iran get elevated to a "revolution". The total death toll of the "peaceful protests" is now some 21 of which (by my count) at least five were policemen killed in attacks by "protesters" and two unrelated civilians who were run over and killed by rioters driving a stolen firetruck. Six rioters were killed when they tried to attack a police station in the town of Qahderijan. The governor there claimed that the attackers were armed with guns. The same faking of pictures of large demonstrations and "evidence" of government brutality that we have seen with regard to the war on Syria is taking place with Iran. Videos of demonstrations from Argentine and Bahrain are used to claim large demonstrations in Iran. A tweet with the Bahrain video by a "journalist" who claimed it was in Iran has received more than 17,000 re-tweets. Videos from Spain or even movie scenes are purported to show police violence in Iran. A video of a man lying on his back and being cared for is once claimed to show that he has been shot by police while at the same time another propagandists claims that the man had a cardiac arrest after police used a taser on him. There are no signs of wounds or other trauma. The dude probably just passed out. The terrorist group MEK (NCRI, MKO) "leaked" fake protocols of an alleged government meeting which it claims shows panic over the protests. Allegedly the government fears the leader of the MEK, Marjam Rajavi. The MEK has paid large sums to get support from politicians, including John McCain in Washington and elsewhere. During the Iraq-Iran war it fought against Iran on the side of Iraq. After the U.S. invaded Iraq the MEK was held in special camps under U.S. control. According to a 2012 Seymour Hersh report the U.S. military trained MEK fighters in the U.S. in sabotage and insurgency technics. These people are deeply hated in Iran but feared they are not. Their early engagement in the "protests" via their website and propaganda ops in Iran may point to deeper role in the riots. The usual neoconservatives in the U.S. media are arguing for "more help" for the "Iranian people". The help they want to offer is designed to worsen their economic situation. European leaders, who have been far more cautious, should speak up. ... On Sunday [President Rohani of Iran] recognized that the demonstrators had legitimate grievances and nominally accepted their right to protest. The Trump administration and other Western governments should aim to hold him to those words through diplomacy and the threat of sanctions in the event of more bloodshed. The rioting at the current level is in no way endangering the Iranian republic. Should some rioters acquire weapons the intensity might change a bit. But unless they receive material and personal support from the outside, like it happened in Syria, the situation will soon calm down. The people of Iran are against such violence and the government has yet to use its manifold capabilities. I had documented in earlier posts that the Trump administration, in tight co-operations with Israel, long prepared for an intensification of a conflict with Iran. Half a year ago the CIA set up a special office with a high level Iran hawk leading the charge. Last month Trump named another Iran hawk to lead the State Department Middle East section. Since the Iranian people successfully achieved "regime change" in 1979 the U.S. and Britain have had an adversarial policy against Iran. It has ebbed and flowed in intensity but never changed. Under Trump we will see a rapid increase of hostile actions. The administration just called for a UN emergency session about the situation. That is a laughable move when one considers the size of daily murder the U.S. and its allies commit in Yemen, Syria and Palestine. But the operation that unfolds now is likely just a small part of a larger anti-Iran strategy that has yet to become visible. I just checked various internet resources for two hours to find new videos of protests/riots of January 2 to 3. There were just a handful and none of them was remarkable. Some short clips of loud screaming of small crowds and light bashing with riot police. The protests and riots are obviously dying down. 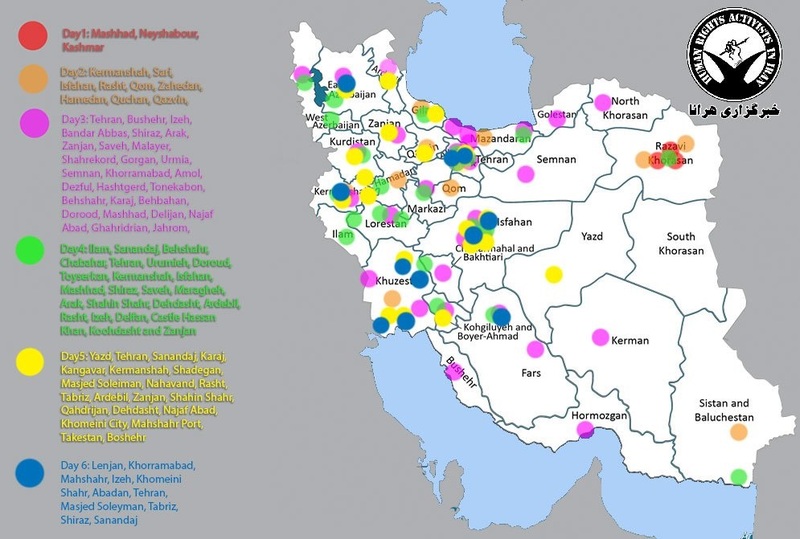 This map is by HRA_news a Human Rights Activists News Agency (HRANA). It says "There were protests in at least 11 cities in #Iran on the sixth day". Eleven cities is less than half than the thirty cities with protests/riots that were counted yesterday.